Recognizing Dewey’s equation for wisdom: experience, plus reflection = knowledge, it is important to think deeply about the feedback given to me by my students. At home, in binders, I have ten years worth of student-feedback that takes up two of my cabinets. I keep my eye on their feedback like it is the last unicorn on earth. On my bad days, I might re-read an item or two. Receiving feedback from students in classes taught at Syracuse University has been helped me to build my confidence as a teacher in the University setting. So much of my public school teaching success was my “Willy Wonka-esque” personality, and I wasn’t sure it would be well received in higher education. I’ve often referred to myself as the character on Ally McBeal named John whose nose would ring in court while defending his client and who had a hidden office within his office where he’d retreat to allow his eccentricities to be free. I dream of being a Jeopardy smart scholar, but then the Robin William’s/Jim Carrey side of me arrives. The result, I suppose, is the feedback I’ve received from students. EDU-508-syllabus-spring-2009) and EDU – 508-syllabus-fall-2009 were two courses designed to provide students with support, supervision, and feedback as they began their first sustained teaching experiences in schools: 6 weeks in the Spring and 12 Weeks in the Fall. EDU 508 is a separate course with its own set of requirements—the first of two such courses in their journey to certification. Upon successful completion of the six-week field experience and related requirements, students received a provisional “V” grade to be replaced by a “P” upon successful completion of their 12-week placement in the Fall. Their experiences as a student teacher nested within their work in SED 413/613 English Methods & SED 415/615 Teacher Development in English, where I worked with Dr. Kelly Chandler-Olcott as a teaching assistant. The primary responsibility assigned to me in EDU 508 was to visit schools to observe my students in action, to document their work, and to make assessments. Each student was visited three times in the Spring and four times in the Fall. In anticipation of the student teachers and their mentors have difficulty keeping up with the goals of EDU 508, I created a checklist for their use EDU 508 Checklist – to assist mentor teachers and students. In addition, their mentor teachers and I held post-observation meetings to discuss progress and areas to think about with the students after observations. I chose to write running field notes of the observations (see sample) so student teachers would have a timed account of what occurred in their room (an extra set of eyes). This style of observation was very beneficial to them, and also assisted my assessments. After each observation, I completed an observation document form to assess a student’s teaching which was provided to Syracuse University (see sample). The assessment forms are designed to meet the proficiencies design to measure their candidacies. In the Fall placements, I began a newsletter to send to student teachers entitled, “The Express(ion).” The newsletter was a way of communicating to student teachers important information. Lisa Pye, another graduate student, and I contributed to the newsletter weekly throughout their placements. The title The Express(ion) was chosen in reference to the movie about Syracuse University football star, Ernie Davis, and was a timely way for supervisors to express information to students. Since I began working with the Sudanese community I’ve kept up with publications and video work that features their stories in America. In the Spring of my first semester at S.U., Dr. Elizabeth Payne allowed me to conduct a mini-field project with the Sudanese men. The following fall, Dr. Collin Brooke allowed me to do a video essay on this work, but also as it relates to the composing process. Before I left Louisville, a friend of mine, James A’Kech Mangui, was murdered. James was a Sudanese man trying to make a new life in America after the long journey he walked as a kid. His death made no sense to me and has impacted my thinking a great deal. I use him as inspiration for the work I currently do. While working with Cow Project, I’ve also volunteered my time to a brochure and contact cards to help with publicity. Because I feel that assisting immigrant populations in America is very important, I’ve enjoyed helping. In addition, Dr. Felicia McMahon also gave me an opportunity to create the Syracuse University Showcase Folk Arts brochure which I did with pride. In the second semester of coursework at Syracuse University, I applied for a “Scholarship inAction” mini-grant offered by Nancy Cantor at the Graduate School. I received this grant and was able to create additional materials for Central New York teachers who wished to teach about the Sudanese immigration story and also to pay men to visit a few classrooms. A few men visited young people at Liberty Partnerships Program at S.U. 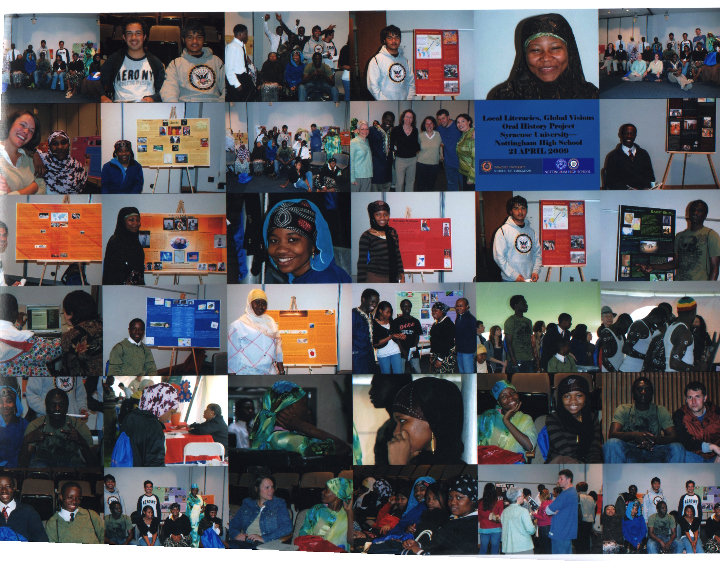 and for the New York State Humanities Council Togetherness program (news article). The mini-grant also allowed me to purchase resources about the men from Sudan to offer to educators in the area and to use in their own curriculum. Because I received a mini-grant, I was asked to present at a poster session during a Forum on Public Scholarship. There, I was able to display several of the clay cows created by the men and also to show the video I created. In the Fall of 2008, I applied to present at the National Writing Project for Urban Educators Conference in Louisville, Kentucky. I wanted to find a way to bring all my passions together and, as luck would have it, this conference did it for me. I could re-unite with the men I worked with in Kentucky, meet with teachers and students at the school where I taught for ten years, see my friends in Jefferson County Public Schools and the Louisville Writing Project, and meet several leaders from the National Writing Project. My session, “In Memory of James A’kech Mangui,” allowed me a place to share this educational journey with others and to inspire teachers and academics across the nation to do similar work. The following is what was presented: “For the past ten years, first in Louisville and now in Syracuse, this presenter has interacted through and learned from volunteer work with several Sudanese refugees (commonly known as the “Lost Boys of Sudan”). Such “Scholarship in Action” began with a six-week unit on imperialism, African Literature, lessons to deconstruct violence in the lives of students and a quest to explore the power of literacy. Today, the Syracuse Lost Boys Cow Project raises scholarship money for men to take classes and to buy books. This is an interdisciplinary workshops requiring writing, thinking, and active participation. In the Spring of 2009, I had the honor of taking a class with Dr. Kristiina Montero from the Reading & Language Arts Center in the School of Education. Under her guidance, I was able to conduct three life histories of young men who have recently arrived to the Central New York area, including a senior at Nottingham High School named Sabit Buol. During Syracuse University’s Showcase, and when the Folk Arts tent had cows on display, as well as Dinka and Didinga dancers upon the Quad, I stood proudly with our young men and women who participated with the life history project. This “Scholarship in Action” opportunity has impacted my life immensely. Listening to, recording, transcribing and writing the life stories of other individuals is very enlightening and educational. Because this research coursework was funded as “Scholarship in Action,” I saw the potential for amazing connections to be made. Meeting Sabit, as well as a young man from Liberia and Bhutan, has been a part of the irreplaceable experience offered by Syracuse University.